In their study, the scientists of KIT, GFZ, Erdbebendienst Südwest – the joint seismological services of Rhineland-Palatinate and Baden-Württemberg – and the State Seismological Service of North Rhine-Westphalia determined that these earthquakes occur episodically in groups that are narrowly limited in time and space and line up along a line between 10 and 45 kilometres depth The scientists conclude that fluids and magmas, i.e. molten rock, could rise from the upper mantle into the middle and upper crust of the earth beneath the Laacher See Volcano. 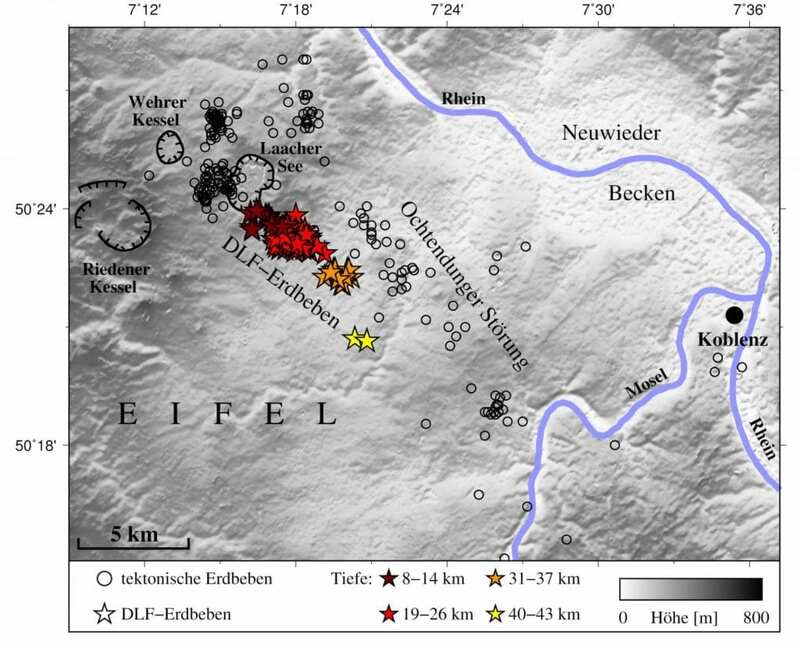 Martin Hensch, Torsten Dahm, Joachim Ritter, Sebastian Heimann, Bernd Schmidt, Stefan Stange and Klaus Lehmann: Deep low-frequency earthquakes reveal ongoing magmatic recharge beneath Laacher See Volcano (Eifel, Germany).